Technology Overuse: What are you missing when you don’t put it away. There is a huge possibility that you are reading this article on your mobile phone. There is even a bigger possibility that you are accompanied by a friend that is either on her/his own phone or upset that you are on yours. By now we should all be aware of the great impact smartphones have on our society. All of this as a consequence of the Facebook/Twitter revolution. These two are now followed by other sites such as Pinterest, Instagram, Tumblr, Vine, … Communication via social media has created a great frenzy throughout the years. Some people find it important and necessary to let everyone know what they are doing at all times. If you are promoting your company or career through social media, posting at all times would be something essential as part of the marketing strategy. But, a great amount of people have made it so imperative in their lives that they end up giving more importance to this piece of technology than to the person or scenario in front of them. It is so sad when you see three out of four people sitting at a table bowing their heads down to their phones. It is okay to take it out if you want to show something to someone because there is an actual interaction with the person sitting next to you. It is also okay to take a phone call by excusing yourself from the table, especially for parents who left their kids with a babysitter for the night. But, there is nothing like a nice dinner and eye to eye conversation where you are able to put your phone in your pocket or purse and enjoy the company. Our cellies not only can be a distraction to yourself at a movie theater, but also to the people sitting around you. That bright light that comes up when you are texting and the phone call you answered in the middle of the movie is very distracting and annoying. How hard can it be to disconnect yourself for 90 minutes? So you pay $$$ to go see a live show of your favorite artist and as soon as he/she comes up on stage, you have that urge to get it on camera. That is fine. These are cool memories that you want to be able to have and to share. Now, it can go a little bit overboard when you end up watching the entire show through the screen on your cell phone. You spend the whole time taking videos or pictures and end up missing what you came out to see. After taking the picture comes the making sure it came out all right. Then you start editing by cropping and finding that perfect filter. Tweet it, post it and tag it! You should be done now, right? Wrong! Now, lets see who ‘liked’ it, who commented and then start replying. Before you know it, you have missed the essence of being there in real time, watching the ‘live’ show. This same process happens in any other social activity or event. I miss the times when you would take the picture and then have to wait to get it printed in order to see it. Nowadays, we don’t wait until we get home to do the editing and sharing. We have that urge of doing it at the moment. I say WE because in more occasions that I would like to admit, I have been one of those. At the end, I end up being upset at myself because it made me miss a great play at a sporting event or a great part of an artist’s performance at their show. I believe that it is very important to step away from technology and enjoy what is going on around you. If you invite people over, focus on them. Whoever is not there does not need your full attention when other people are there waiting for you to finish texting, posting, reading your newsfeed, checking out what is new on Instagram or what your favorite artist had for dinner through Twitter. Prioritize in life. I cannot say the same thing happens with computers, as they are not as accesible on a minute to minute basis. Most of the time you sit in front of a computer and it is to work or do something else that requires attention. But with the cell phones, there should be some sort of self restrictions being that we have them on us every single time of day. It is okay to play games and browse through all the great applications out there while you are alone or waiting at a Doctor’s office. Along with reading a good book you have left behind on the bookshelf at home, these can be really good ways to make time go by faster. Don’t get me started with the texting and driving. You are not only risking your life but you are also risking the other driver, cyclist or pedestrian’s life. Knowing in what situations to throw your focus on your cell phone and when to put it aside is about respect, to you and others. 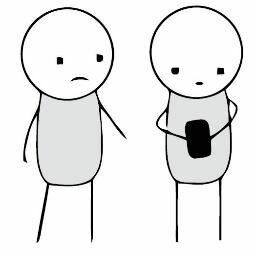 Recently I saw the change in two teenagers and their friendship when their cellphones were taken away by their parents because of grade issues. I attended one of my nephew’s sporting events and they are the sisters of two of the other players. I noticed how they were more or less the same age, sitting close to each other but had absolutely no interaction with one another. One was on Instagram and the other one I am not sure, probably the same. For one hour and a half they stood there looking at their phones, missing their brothers’ game and whatever could have been going on around them. A few weeks later they ended up being punished right at the same time because of bad grades at school (I wonder why). One of the days at the baseball game, they had no choice but to watch the game, talk and interact with each other. 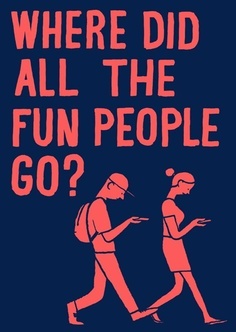 Soon enough they were laughing, talking and having simple, non-technological fun. To this day, they have become best friends. I love how when they got their phones back, they still managed to leave them in their pockets and admitted to not having that need to check them constantly anymore. They started living the moment. 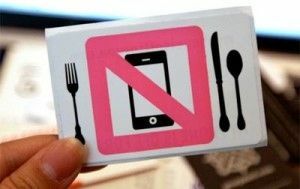 There should be some time restrictions for children, teenagers and adults as to the usage. There is no problem with shutting it down for a bit. Again, not everybody can do this because of some work requirements or other situations where you need to be reached. But if this is not the case, it is totally fine to just put it away and do something more meaningful. I am not going to be a hypocrite and say that I practice all of this. But, watching these different situations on a daily basis and actually have had friends and family ask me to put my phone away, I am more and more aware of how it is something that needs to be changed. I feel that everyday I am getting better at it and it really feels great. I don’t have as many pictures on my phone anymore that were taken with the cyber sharing purpose in mind and I don’t post everything that is going on in my life. I have been able to enjoy life more, appreciating what is going on at the moment, and have also learned to keep many personal things out of the social media eye. Privacy can be very rewarding, especially when starting a new relationship. Now, share this article and put your phone away!!! Posted on December 3, 2013, in Lifestyle and tagged Cell Phones, concerts, dining, facebook, Instagram, Mobile phone, photography, Pinterest, Science and Technology, social, Social media, Twitter. Bookmark the permalink. Leave a comment.